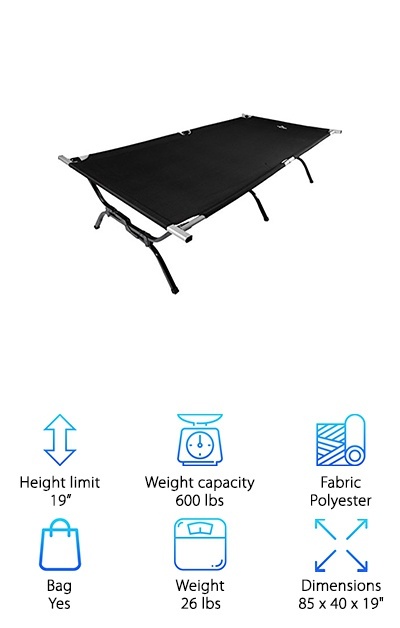 A camping cot can keep you off of the ground and makes camping just a little more comfortable. So if you’re in the market for the best camping cot, no worries. We’ve done all of the leg work for you! We wanted to know what the best cot for camping is. So we researched and reviewed the all of the highest-rated cots we could find, building a list of our top ten. Not only that, but we also put together a list of some stats we used when shopping to help pick our favorites. Here are all the stats and what they mean. Height limit - How high will your cot get you off of the ground? We’ll give you the highest height limit for each cot in feet. Weight capacity - How much weight can the cot handle? Make sure you’re covered; we’ll give you this stat in pounds. Fabric - What kind of fabric is the top of the cot made from? Most are made from polyester or other waterproof fabrics. Bag - Carrying bags can be useful; it keeps them compact and clean when not in use. We’ll let you know if it comes with one. 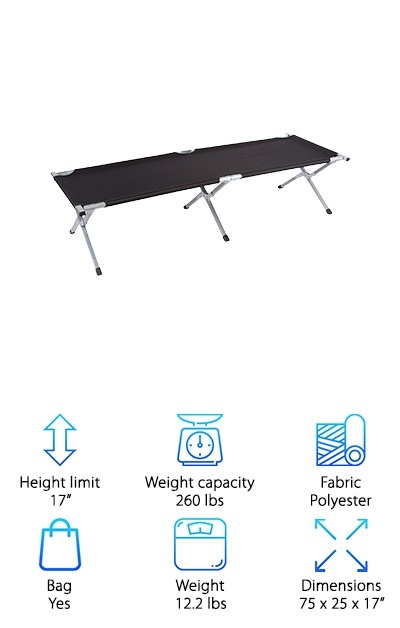 Weight - Planning on carrying this cot around for hiking? You’ll want to know the weight because every pound counts out there. Dimensions - How big is it? Make sure the cot is the right length and width for your body. We’ll measure all of the cots in feet. It’s time for the camping cot reviews! We loved each and every one of these cots; they have all passed a rigorous selection process that really narrowed down our favorites. But there were two that really stood out from the rest of them. They are the Top Pick, which was our absolute fav, and the Budget Pick, which was an inexpensive cot that was still amazing. If you’re in a hurry, be sure to at least check out those two! Now let’s get to those camping cots reviews! While looking around at all of the most highly-rated backpacking cots reviews, we stumbled on this gem. And we’re glad we did! The Kingcamp Ultralight Cot is rated very highly, is lightweight, and is perfect for your next camping trip. It comes in a variety of beautiful colors, like red blue, black, and green. 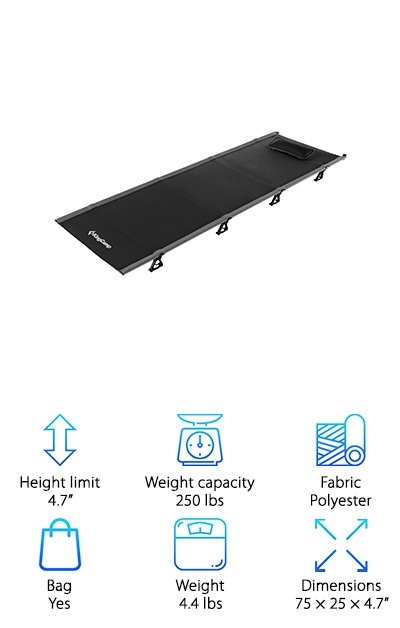 The frame is made from durable aluminum that is difficult to bend or break while the fabric is a 420D polyester that seems nearly indestructible with normal use. These cots are some of the most comfortable cots ever, and they can assemble and disassemble in seconds. It also folds down small to make it easy to pack. 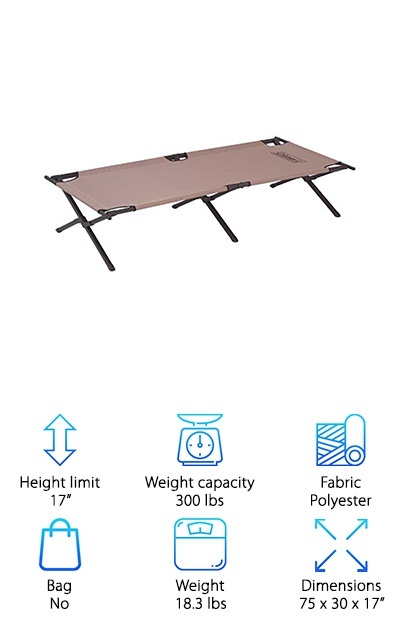 And not to mention that this whole cot only weighs about 4.4 pounds total, making it ideal for backpacking, hiking, and your next camping trip! Now onto our Budget Pick’s camping cots reviews! The Trademark Innovations Cot is lightweight, easy to use, and comes with a lightweight carrying case. This cot weighs about 12 pounds, making it a little heavy for backpacking. However, it’s perfect for camping, short hikes, and more. It can hold up to 260 pounds and is 75 inches by 25 inches, making it big enough for most campers. The bed doesn’t fold very small, but it is lightweight and easy to store away in your car or camper. 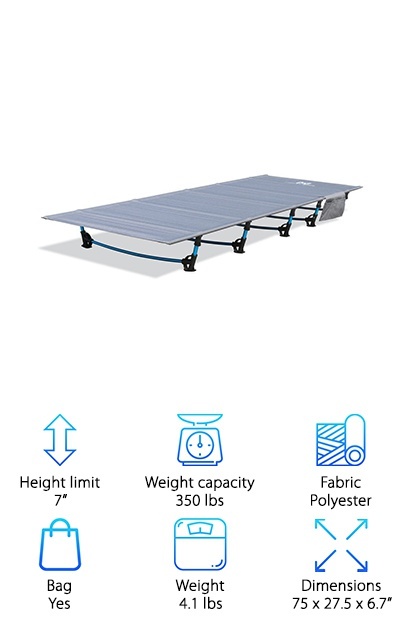 This thing is built to last; all of its sturdy components come together to make a stable cot that stands up against bending, ripping, and breakage. And the best part about this cot is the price! It’s very economical, so you can buy one for everyone in the family if you have to! Need something extra strong? 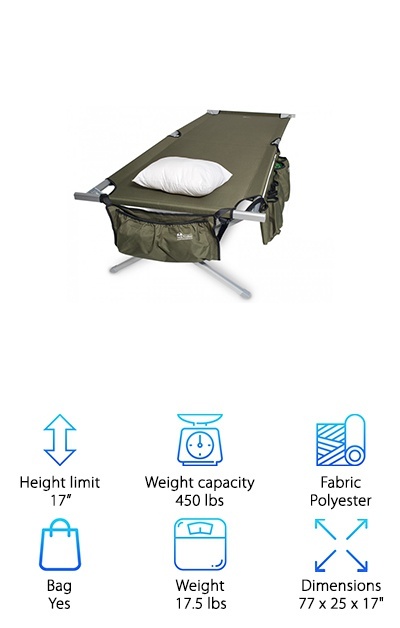 The EARTH Military Style Cot comes in at a whopping 17.5 pounds, but more than makes up for it with its strong, durable frame that can hold up to 450 pounds! The polyester cover keeps it protected and is washable and water resistant. And this big cot folds down to a mere 38 by 8 by 6 inches, making it ideal for carrying around. It’s also covered by a 5-year warranty. 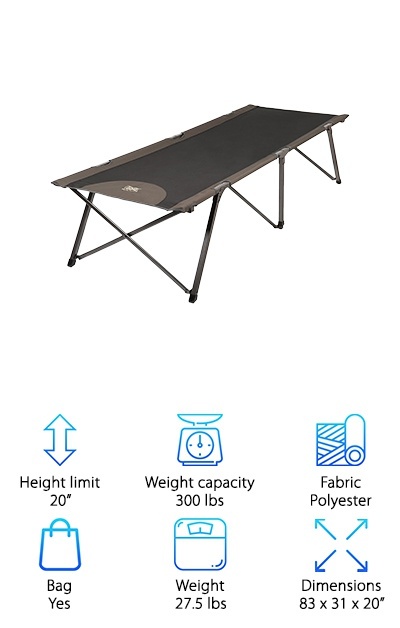 That’s probably because the metal frame, as well as the no-tear polyester fabric, makes it ideal for even the roughest handling. But our favorite part has to be the adjustable tension! The straps that hold you up are high-quality velcro, making the tension customizable. If this thing wasn’t quite so heavy, it might have been our Top Pick on this list! But if you are looking for one of the most comfortable camping cots, look no further. The Byer of Maine Cot is made from sturdy, welded steel and 600D polyester fabric, making it hard to break. It holds up to 325 pounds on its strong frame. It can sit up to 18 inches up off of the ground, and it is 78 inches by 31 inches, making it large enough for just about everyone. It’s great for camping, sleepovers, and even campers. It folds down small so you can store it just about anywhere. It comes with its own convenient carry bag too, to make sure that it stays together, folded up, and protected. The frame doesn’t make any noise either, so this cot is perfect for just about any sleeping situation. And it’s one of the most comfortable cots ever! While it’s too heavy for backpacking, it’s certainly not for everyday camping uses. We love the Byer of Maine Cot! The Timber Ridge Cot is a very highly rated camping tent. And we’re pretty sure we know why! The tent cots reviews rave about its durability, size, and height! It’s covered by a 1-year warranty against manufacturing defects and bad materials. The cot folds out to 83 inches long by 31 inches wide by 20 inches tall, making this a very tall, very big cot. It folds down small too; the folded dimensions are 40 x 7 x 5.5”. The super sturdy, no-tear 600D polyester fabric is ready for just about anything. It can hold up to 300 pounds, making it perfect for almost anyone. It’s quick to setup and even quicker to pack up. And it also comes with a 1-year warranty to help protect you from manufacturing defects or problems with the materials. When the Teton XXL says “XXL,” it really means it! Supporting up to 600 lbs, this cot is massive and very sturdy. It measures 85 inches long, 40 inches wide, and 19 inches tall. It packs down to a very small 42 by 12 by 7 inches, as well. The whole cot weighs about 26 pounds, lightened by its aluminum frame. The legs are stabilized and strengthened by a unique, s-shaped design that is completely unique. The fabric is a no-rip, heavy-duty 600D polyester canvas. But the best part of this amazing cot is the lifetime warranty! If you are looking for a big cot and a great deal, you can’t beat the TETON XXL Camping Cot. It’s one of the best cots we’ve ever seen! And we’re pretty sure you’re going to love it as much as we do. The camping cots reviews OUTAD Camping Cot are in, and they are nearly universally glowing reviews! It’s hard not to love this cot; it’s simple, lightweight, strong, and comfortable. In fact, it might be one of the most comfortable cots in the whole world. 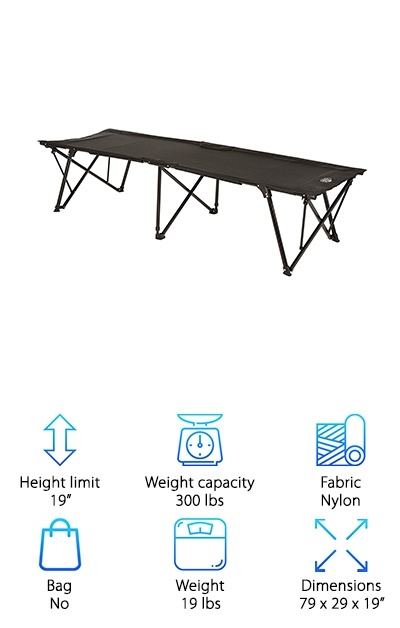 It is super light at just three pounds, making it the perfect cot for backpacking; even at that light weight, it still holds up to 440 pounds! It unfolds to a whopping 79 inches long, 24 inches wide, and about six inches tall. The cot is enough to keep you safe off of the ground with its aluminum frame, steel tubes, and strong, composite fabrics. It’s a snap to fold down or unfold, and it is made from waterproof fabrics. And it comes in several colors including a pale gray, purple, and army green color. The Coleman Trailhead II is a great product from a trusted brand of camping equipment. This cot is made from high-quality materials like heavy-duty polyester fabric and a dual-cross-bar steel frame. 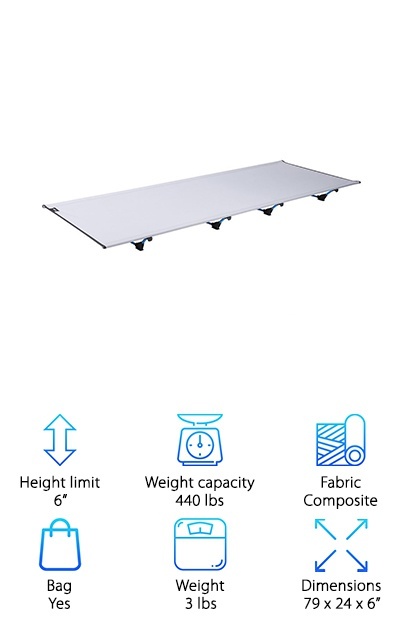 It unfolds to be 75 inches long by 30 inches wide and 17 inches off of the floor, and it folds neatly for storage, making it 40 by 8 by 4 inches. 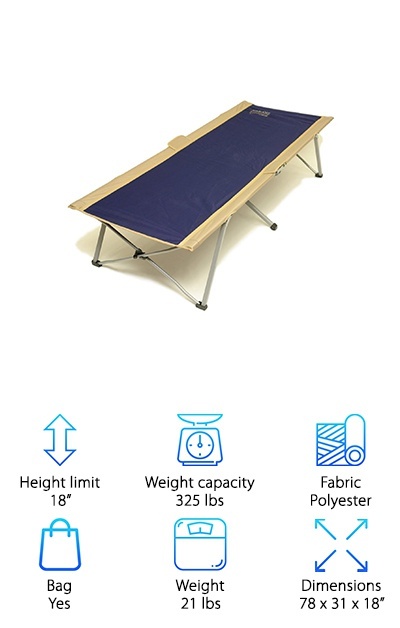 This cot can support up to 300 pounds of weight and is large enough for almost everyone who needs a camping cot. It’s easy to put together, easy to unfold, and even easier to fold it back up again and store it away when not in use. But our favorite part is how comfortable a firm this cot is. If you like sleeping on a firm mattress at home, the Coleman Trailhead II is a great cot for you to look into. We’re pretty sure that you’ll love it! Our favorite part about the Moon Lence Ultralight Cot is all of the bright, designer colors it comes in! It is available in bright blues and greens, brightening up your camping spot. It’s also super durable and strong; it’s made from some seriously heavy-duty materials. The frame is made from aluminum alloy and the fabric is a 420D, super thick polyester that is built to last. This cot can support up to 350 pounds! It weighs only 4 pounds too. What an incredible cot! It’s so portable, you can bring it almost anywhere. It’s so light, you can carry it in a pack on your pack with almost no effort. And the best part? This clever bag that holds your cot can also double as a pillow! What a clever idea! The Kamp-Rite Kwik Cot is incredibly compact and easy to use. Its powder-coated steel frame helps to support up to 300 pounds of weight. The 1000D nylon fabric is heavy-duty, hard to rip, comfortable, and waterproof. The Kamp-Rite Kwik Cot folds up tight, wrapping itself closed with its own built-in straps. The cot folds out to 79 inches long by 29 inches wide by 19 inches tall. Folded, it is 39 by 8 by 7 and weighs in at 19 pounds. It opens up in seconds and even closes down just as easily. But the coolest part of this cot has to be the little extra feature thrown in. This cot has a small, padded headrest, making it the only cot on this list with a built in pillow. It also features a clever mesh storage pocket to some things off of the ground and securely next to you.